Attorney Marc L. Breakstone is interviewed by WHDH TV after criminal indictments come back against the Lynnway Auto Auction and its president. Both the corporation and the president are being charged with five counts of manslaughter in the fatal crash that claimed five lives in 2017, injuring seven others. The Middlesex County District Attorney's office said investigators determined the corporation - which is based in North Billerica - and the president were aware of safety shortfalls and failed to ensure all drivers were properly licensed and trained. 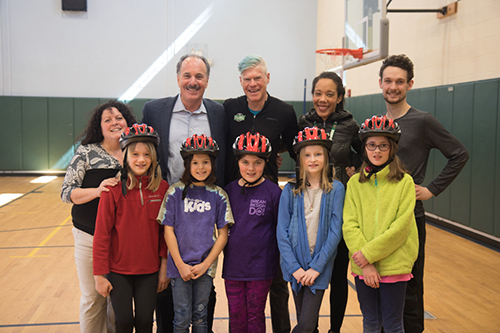 Breakstone, White & Gluck began its 2018 Project KidSafe campaign by donating bicycle helmets to fifth-graders at Arlington's Pierce Elementary School. Attorney Marc L. Breakstone was among the participants at a special bike safety training. Coverage on our blog and in The Arlington Advocate. The League of American Bicyclists recognized Breakstone, White & Gluck with a Silver Level Bicycle Friendly Business award. This is a special honor; only a few law firms have been honored in the Northeast. We were recognized for our Project KidSafe campaign, which has donated over 15,000 bicycle helmets to children to prevent head injuries, and our work to encourage safe cycling in Massachusetts. Our firm has long supported bicycle clubs and advocacy organizations working to improve safety conditions. After a woman was seriously injured in a slip and fall on an icy ramp, Attorney Marc L. Breakstone investigated and determined the ramp was in violation of state and local building codes. We were proud to celebrate our 25th anniversary of serving our clients in June. 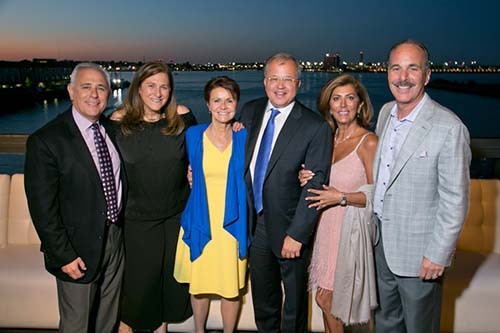 We celebrated with family, friends and colleagues at Legal Harborside in Boston. Attorney David W. White Interviewed for NBC Boston Story, "What's Next for Prospective Tenants After Dorchester Fire?" Attorney David W. White was interviewed for a story on pothole damage to motor vehicles. State law provides drivers 30 days to file a claim, but there is little chance of actual recovery, he said. "Unfortunately for consumers, it's a miserable law. Across the board, the municipality or the state is going to raise the claim of what's known as contributory negligence. If you are one percent at fault, you get zero percent recovery." Attorney Marc Breakstone comments as a legal expert for Fox 25 TV last night about the criminal charges against the driver who recently killed State Trooper Thomas Clardy on the Mass Pike in a tragic collision. Click to view the Fox 25 TV report above. Our attorneys joined hundreds of lawyers and advocates at the State House to lobby for an increase in civil legal aid funding. The walk was organized by the Equal Justice Coalition.